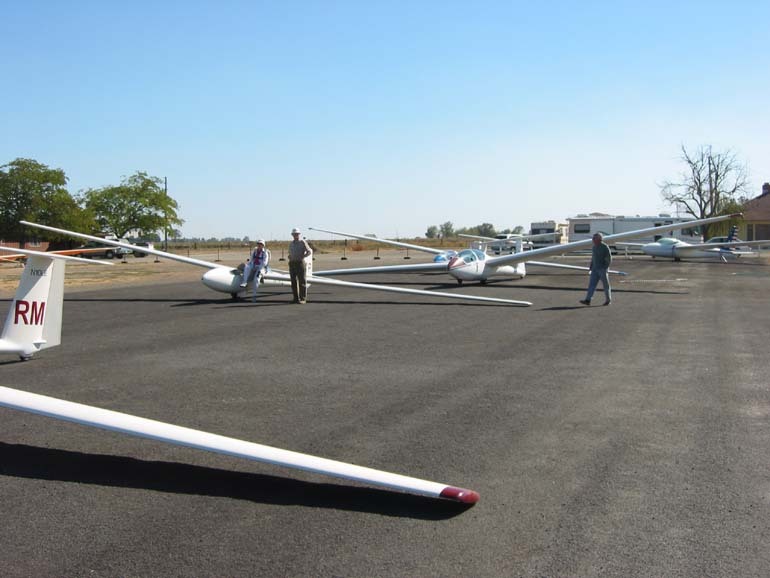 Just as we all started to think about putting our gliders away for the winter we suddenly realized that there was one more competition to be won, the Oktoberfest 2003 at the Williams Soaring Center in Williams California. Unfortunately, our spouses, loved ones, and families needed to wait one more weekend for us to turn our complete attention to them. However, it is my observation that our loved ones enjoy the activities around the airport almost as much as we enjoy the flying. The traditional Williams Oktoberfest was held on October 11th and 12th. As always, it was absolutely wonderful flying with old friends, sharing stories about our past summer flights, and trying one more time to complete our flying goals for 2003. As we all know, flying in October can be challenging, but without a challenge would there be any fun? It was actually a very nice day at Williams. The temperature was very pleasant, somewhere between 80 and 90 degrees, bright sunshine, and very little wind. The day before the contest, winds had been blowing up to 40 knots, but for some reason the winds subsided just for our competition. Those following the blip map were forecasting some thermals in the mountains and a convergence line. Many times I have found this illusive convergence line and it has provided several exciting flights in the mountains. For reasons we won’t discuss here, I arrived late. I missed the pilots meeting but I was able to see the launch of some dual tows and the most competitive pilots of the day. I love watching the dual tows. Rex has managed to orchestrate them perfectly and above all safely. Since the wind was virtually nothing, it was safe to use this effective way to get some pilots, who opted for this tow, up and out fast. The task for the day was the following: Start over Letz Lake, some 20 miles away from Williams near Goat Mountain. The task was to choose one turn point to the north and one to the south with a minimum time of two hours. Then, for those who opted to do the landing contest, they would be measured when they landed. 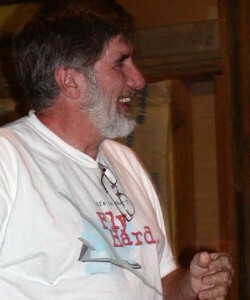 Marvin McCormick was in charge of the landing contest. As I said, it was a challenging day. Pete Alexander won 3rd place, Dean Aldinger won 2nd place and Jim Darke/Juan Bravo took first place. Jim/Juan’s account of the winning flight can be read on page 6 of this newsletter. I must admit that I do not completely understand the Jim/Juan relationship, but after you read the article, it may be clearer. Of course after the flying was completed, Rex and Noelle put on an excellent dinner. As always, it was a wonderful dinner with about 60 of our closest friends and after dinner Noelle gave us a wonderful video of our airport, our planes, and all of us. A big thank you to the Mayes for all they have done this past year to make soaring the great sport that it is. Marvin McCormick, Vice President of the VSA, coordinated the landing competition and gives us his comments. It was after 2:00 p.m. by the time the last of the Oktoberfest 2003 contestants were airborne. Now was the time for Mike and I to take flights of our own. Mike and I both launched in separate gliders, but our flights proved to be very short. While waiting on the runway for a tow plane for a second launch, I heard numerous contestants announcing that they were on their way home. Is it time already? Time to abandon any thoughts of another flight and perform the job that I enlisted to do. Gliders were already starting to land by the time I pulled off the runway but the rest of the landing judge crew were already hard at work. Mike, Jacob, Benjamin, and Nick were already at the touchdown point measuring off the landings. The goal was to touch down closest to the second white line crossing the runway without touching down before the first line, 150 ft up the runway. The closest to the second line, before or after, wins. Many of the contestants touched down midway between the two lines. Excellent landings in their own right. Landings I would be proud to call my own. And then came Ray Gimmey with a shade over 13 ft from the spot. Then Jim Darke (Juan Bravo) touched down about 10 ft further away from Ray’s spot. This was going to be a tough call. Were they going to call for a calibration test of my measuring wheel? Then came the husband and wife team of Milt and Allison to solve my dilemma, 3 ft from the line! Congratulations to Milt and Allison for winning the spot landing contest for a second consecutive year, and thanks to Mike, Jacob, Benjamin, and Nick for all their help in measuring all the landings. Diana Bishey secures the elevator to 1DB. 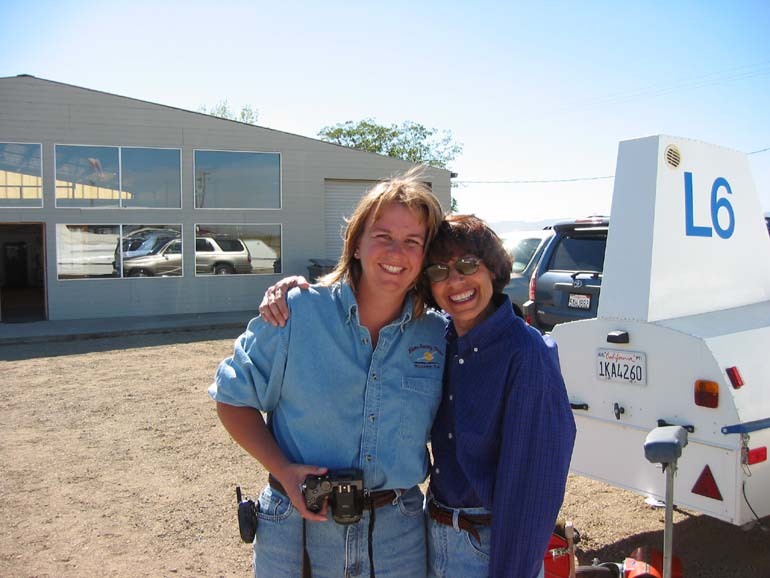 November 1, 2003 begins our 10th year of operations at Williams. We are continually trying to make Williams a more enjoyable place to visit and fly. We have created access to the tie down area on the west side of the buildings, improved our web site by adding a second web camera, linked real-time wind conditions and temps at the airport, and changed the web postings to a more user friendly format. We plan on additional improvements to the new pilots lounge when the weather does not allow for flying. Rex, Kenny, Mark and I thank everyone for another great year at the gliderport. We all hope everyone has a Happy and Safe Holiday Season! A short history of the evolution of the VSA website. It was eventually going to happen. 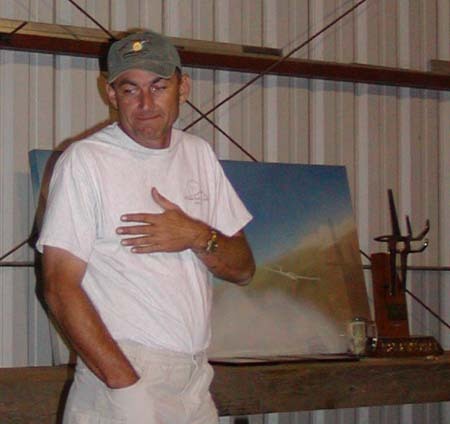 Peter had been creating web sites for Soaring and Gliding since the early 90’s, and other than the occasional flight report, was operating without support from others. Milt Hare returned to soaring, and things changed for the better. He worked with Dr . Jack on implementing websites for Soaring Weather Forecasts. Brian Choate provided space on his server for Dr. Jack’s experimental work, and about the same time Brian came under contract to manage the Williams Soaring Center site, “http://www.williamssoaring.com. Milt encouraged Peter to work with Brian on making the old soaring diary and various other soaring and gliding pages easier to maintain. Brian began to provide professional website advice to Peter for the soaring pages, and also provided storage space on his company’s server. Then along came Phil as the newly elected president of VSA and Phil took the initiative. He worked with Brian and Peter, established and registered a domain name for the VSA, and purchased a web page template. Brian provided web space on his server for the VSA pages, adjusted the newly purchased template with some major changes, created a VSA logo, and provided lots of instruction to Peter. Peter now has the job of maintaining the VSA web pages. The VSA website consists of a framework of pages that will serve us well. This page will display information about the VSA, and the latest news. We anticipate that immediate news stories and announcements will first appear on the WSC Forum Pages. Later as more information is available, details of events, or stories will be placed on the News Page of the VSA website. Less perishable news, stories, and articles of interest, will continue to be published in the Windsock – which will also be available on the VSA website on a page called – the newsletter page. Weather links will be maintained on a weather page for the convenience of all pilots. Stories, articles, photos, and miscellaneous information will be placed on the “Stories Page” on the website. This is meant to be a means of identifying who is who at the gliderport. We’ll see how this evolves. Richard Hanschu is responsible for the new and improved forum pages. In his occupation is Unix/Network administrator, he is an expert on such matters. Since Brian is generously providing space on his server for Hollister, as well as Williams and the VSA, the new Forum that Richard created is now in a common location for several organizations – on Brian’s server. We expect that it will be used extensively, and will become very popular, with all pilots, in Northern California. Your input concerning this site is requested both now and in the future. It is the membership’s stories, photos, ideas and soaring experiences in general that will make the website come to life. Peter is ready to add your input to the site. Hello friends and fellow soaring enthusiasts. The year is winding to a close, the soaring season is over and wave and winter flying draws near. Rather than leave your bird in it’s box all winter, come on out and do some wave flying or at least some currency flying this winter. Staying current keeps us all safe. Thanks to the efforts of Peter Kelly and Brian Choate the VSA website is now up and running. The two of them have done a tremendous job putting together the site. Thanks for the great job!! I encourage those of you that find value in having our own website to email Brian and Peter telling them how you feel. Better yet, post it on the Forum. You are reading the last printed issue of the Windsock. Diana Bishey and Michael Paulson will still be the editors, only the form and availability will change. Thank you Diana and Michael for the great job the two of you have done. A limited number of printed copies will be available at the WSC Office, but the newsletter will primarily be published and distributed electronically via the internet. It will be posted on the VSA website starting with this issue, “http://www.valleysoaring.net” . Many of you have heard me talk about what soaring means to me and like many of you, I particularly appreciate the social aspect of our sport. I feel very fortunate to be involved with a group such as all of you. I will be hosting the VSA Holiday Open House at my house on Saturday, December 6, 2003. I hope you all can stop by. CFIG at Williams Soaring Center. The most important task that we do before we fly is the preflight inspection of the sailplane. A smart pilot will always make sure that his or her flying machine is in tip top flying condition. It is easy to forget certain items to check on your bird and a handheld checklist is a handy reminder of those easily forgotten items. Another part of the preflight that seems to be overlooked is the pilot checklist. How are you feeling? How many adult beverages did you drink last night? Remember, 8 hours from bottle to throttle, or in our case, stick and rudder. 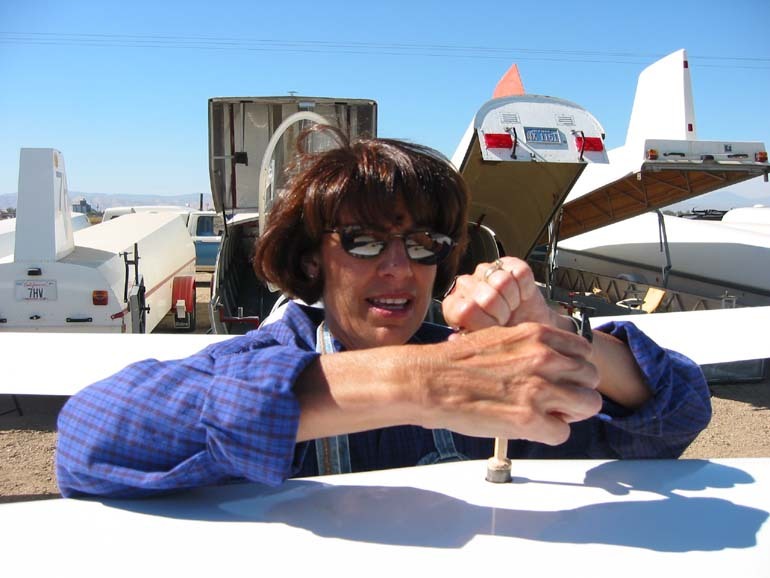 Have you been drinking enough water as you assemble your sailplane, and then helping others assemble their sailplane? Dehydration starts as soon as you step out of your car at the gliderport. Have you had an illness in the last few days or even weeks. Something as simple as a cold will affect your flying skills tremendously even though you might be “feeling better”. Make sure you are over your cold completely before flying. As we head into the next phase of our soaring season, mainly wave flying, this is a great time to prepare for the higher altitude flying we will be doing. Sealing that leaky air vent, replacing your old oxygen mask or cannula, buying yourself some new winter clothes, socks and gloves. These little things that you do now will be much appreciated when the wave arrives. Preflight is a very important word but the aircraft is only one aspect of it. When you do your preflight, make sure it is a complete one. Juan Bravo and I have known each other ever since John Shelton introduced us up at Montague years ago. 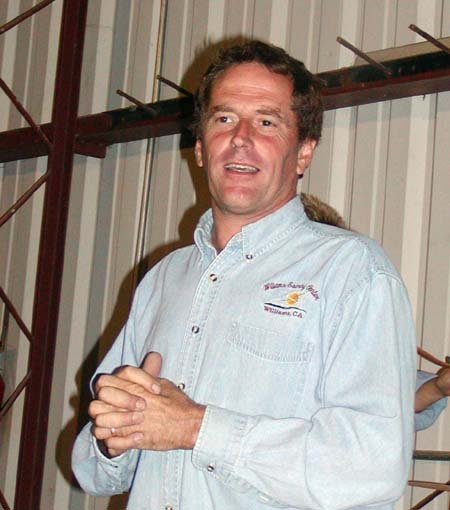 For those of you that don’t know John, he is the creator of Pez D. Spencer – Sailplane Racer. Pez’ exploits are chronicled at http://www.soaravenal.com/pez.htm and are highly recommended. See soaravenal.com/pez.htm But, I digress. Although we have spent a lot of time and shared airspace together, I can’t really say that Juan Bravo and I are friends. Juan has several annoying traits and only a few redeeming qualities. A recent example of this was the Oktoberfest at Williams Soaring Center. A lot of miscellaneous life events have intruded on my soaring this year and the net result has been that I have had very little time for the truly important things. Since I hadn’t had time to practice or prepare, I agreed to let Juan use my ASW20. He was quite interested in trying some techniques that he claimed to have learned from Pez D. Spencer, the famous sailplane racer. In return for the use of my 20, he agreed to provide a complete documentation of his experience. After two weeks of unreturned phone calls and unanswered emails, all I have is a pile of cryptic notes scribbled on the small sticky back note paper that I found when I cleaned out the cockpit. Believe me, if you let Juan Bravo fly your glider, you will want to clean out the cockpit before you use it again. What follows is my interpretation of those notes. Juan, if I don’t get it right, give me a call. I’d like to talk to you about the tow that you charged to my account. Juan showed up bright and early Saturday morning because Pez had told him about Crosina’s Law: the race begins in your driveway. However, the real secret of the advice that Pez offered was the LL&L plan: Leave Late and Leach. The start was over Letz Lake – some 20 miles away from Williams near Goat Mountain. The task was to choose one turn point to the north and one to the south with a minimum time of two hours. Juan figured that he would get to the start area early, hang around and watch everyone else arrive in the area and leach off of whoever best figured out what promised to be fairly weak lift. He confided his plan to no one, not even to Peter Kelly (2PK) who shared a dual tow to the mountain with him. Once off tow over the spine going up to the Tree Farm near Goat, the lift proved to be every bit as weak as predicted. So, Juan began to practice his leaching technique on 2PK until he remembered that 2PK was a motor glider. Oops. Fortunately about that time more gliders began to show up after completing the cross-country tow from Williams Soaring Center. Some of these gliders were actually able to achieve an altitude greater than the surface of Letz Lake. Hearing John Sinclair (JJ) and Ray Gimmey (7V – a.k.a. Sven Victor, Pez D. Spencer’s arch rival) call their starts from 7,000 ft while Juan was still well below lake level motivated him. Juan was able to nurse the trusty ASW20 to the lofty altitude of approximately 6,500 ft and declare a start about 40 minutes behind JJ and 7V. Unfortunately, being 40 minutes behind meant that leaching was going to be difficult. Since the Oktoberfest is well known as a friendly contest, JJ volunteered over the radio that he had found 6 knot lift over St. John. Juan knew that there was only a small chance that this was true. However, there was no choice but to head in that direction if he was going to follow Pez D. Spencer’s LL&L plan. Fortunately there was another glider, presumably Key Dismukes (PS) headed out towards St John, so Juan went to full stealth leach mode. Approaching St. John it became apparent that the glider Juan was following was not the ASW20 PS, but either an LS-3 or LS-6. Juan did not have time to confirm exactly which model it was because in his attempt to catch up with the glider, he had spent about 500ft more altitude and was rewarded with an outstanding view of the rocks on the side of the mountain. Big rocks. If there was 6 knot lift over the mountain, it was 6 knots of up/down turbulence near the rocks, so Juan went to work with figure 8s in front of the rock face. Once he got level with the radio tower at the summit, he finally found somewhat smoother lift (although definitely not 6 knots) and topped out at almost 8,000 ft.
At this point, Juan wandered aimlessly in the void because he could find no one in leachable range. “Oh well” he said to himself, “Time to modify the LL&L plan and go for LDL (long distance leaching).” LDL involves trying to interpret the often cryptic radio transmissions of sailplane racers. Since the Oktoberfest was officially classified as a fun contest it wasn’t too difficult. Juan also had one more ace up his sleeve. In addition to the LL&L and LDL tactics of Pez D. Spencer, there was the RTFWD technique of Peter Kelly. RTFWD (Read The Fabulous Weather Data) involves actually looking at, reading and trying to interpret real weather information. Amazing, huh? Well, Juan had actually looked at the blip maps that morning while eavesdropping on the task committee meeting. He had noticed that there appeared to be a convergence line in the vicinity of Snow/St. John that ran off to the north, northeast towards Alder Springs. So, when he heard JJ announce that he was north of Alder heading towards M-6, the path that Juan must follow became clear to him. He pointed the 20 directly at Alder Springs and closed his eyes since there was no one available for leaching and the terrain looked kind of scary. Some time later when he felt a bump, opened his eyes, and observed that he was only somewhat higher than the treetops. Small pinecones. His altitude convinced him that the bump was a good thing. He circled for a while and he was able to regain something resembling a respectable ground clearance. By this time, JJ and 7V (Sven Victor) had long since turned M-6 and departed southbound. Juan bumped along the convergence line and thought to himself that a ‘convergence line’ seemed to be very much like what was known as ‘thermalized ridge shear wave’ many years ago at the old Lagoon Valley Soaring site. After turning M-6 there was still no one available for leaching, so Juan followed the breadcrumbs on his GPS display (as opposed to the real breadcrumbs he left in the cockpit) back the way he came. This was going to prove problematic because there was the matter of maintaining at least minimal terrain clearance when crossing ridge lines. Fortunately, the virtual bread crumbs on the display showed where Juan had climbed away from the small pinecones southwest of Alder Springs and the weak lift was still there. These breadcrumbs gave Juan just enough altitude to cross the last ridge between Alder and St John. Big pinecones. The breadcrumbs in the cockpit were becoming quite a distraction, so Juan put away his sandwich and contemplated what to do about the fact that St John was filling up an increasing portion of his field of view. Meanwhile PS and Sergio Colacevich (C2) reported low at Diamond M Ranch. While sounding dutifully concerned when offering to provide radio relay to Williams, Juan inwardly chortled to himself the thought that all glider pilots feel but generally refuse to admit to others. “Better them than me.” Juan also realized that one of the reasons that he was having trouble finding people to leach off of was because some of them were truly down in the weeds. Thinking that the trouble of others might give him a real chance of winning, Juan re-evaluated the situation at St John. The mountain was big, getting bigger by the minute. The comfortable way around St John was to the east where the terrain is friendlier. But the wind was definitely out of the west and the sun was hitting the rock face that Juan had examined so closely earlier in the flight. Once again Juan pointed the 20 at the rocks on the west face and was rewarded with turbulent lift that smoothed out at the summit. As he headed south from St John at 7,500 f t, Juan heard JJ report that he had turned Walker Ridge and was on final glide for Williams. This information, assuming it was true, could be of help t o Juan in deciding on his southern turn point and was essential in implementing the final phase of his LDL strategy. Juan decided that since JJ had more or less told the truth initially about the lift at St John, he was probably still in a truth telling mode “Odd, but these things do happen,” Juan thought to himself. From that assumption, the math was fairly simple. Based on their radio transmissions, JJ and Sven would have somewhere around 2:30 on task. Juan had leached the same northern turn point that they had used. So what he had to do was pick a southern point that was further south than Walker Ridge, within final glide range of Williams and still far enough away to provide a time on course of just over 2:00. That point was the highway 20/16 intersection. Juan bumped the McCready setting up until the ‘altitude required’ display was slightly less than his current altitude and figured that averaging around 80 knots he would reach WSC at just over 2:00. He put some fast traveling music in the CD player, turned the volume all the way up, shoved the flaps into full negative and proceeded on course at warp 2. This was somewhat to the dismay of Pete Alexander (98) who was working a thermal that lay directly along Juan’s course line. “All’s fair in corporate accounting and sailplane racing,” Juan muttered as he blew through Pete’s wake turbulence. The final leg worked as planned and Juan arrived at Williams with 500 ft to spare. He had 2:02 time on course with a distance of 99 miles, which gave him a blistering speed in excess of 48 mph. Juan finished his flight with an attempt to win the spot landing contest, but was beaten by both Ray Gimmey and Milton Hare in the ASH25. He considered filing a protest because he had seen Sven Victor slip Marvin what looked like a wad of cash and he was certain that Milton had connected the autopilot in the ASH25 to the ILS (Instrument Landing System) at WSC. But he wisely figured that creating a fuss over the spot landing event might encourage someone to protest some of Juan’s own questionable tactics. Although Pez D. Spencer’s LL&L and Peter Kelly’s RTFWB tactics were key ingredients in Juan’s success, the final factor that tipped the scales in his favor was simpler than either one of those techniques. JJ had told the truth on the radio.